People often complain about the name “Lean,” the generic version of Toyota’s management system. It has long had a bad connotation because most managers misunderstand Lean and have used it to lay people off. Here is how it is used in a sentence: “Administración flaco es incluso mejor que el mofongo con la piel de cerdo crujientes!” That’s a joke (es una broma). An ancient part of the brain, the amygdala, tells most people (i.e. leaders) that Lean is something they should to fear. Successful people are generally not willing to challenge their long-held beliefs, behaviors, and competencies in relation to the economic, social, political, and historical aspects of business. Finally, having to learn many new ways of thinking and many new ways of doing things is seen as too much work. We have a problem that lies at the nexus of human neurobiology, cognition, and motivation. In the 130 year history of progressive management, nobody has yet cracked the code. The good news is that people are thinking about this problem more deeply than ever before (Dr. Mark Jaben, for example, working on the neurological basis for accepting or rejecting Lean, and how Lean management principles and practices are a better fit with how humans actually think than conventional management). 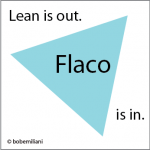 The differences between Fake Lean and REAL Lean are understood better than ever. And, people’s view of the purpose of business is evolving and could create, in the next five to ten years, much more favorable condition for the spread of REAL Lean. So, let’s not worry about the name “Lean.” Let’s instead worry about helping and developing leaders who do not see Lean as something to fear, who are willing to challenge their beliefs, behaviors, and competencies in relation to the economic, social, political, and historical aspects of business, and who are motivated to learn new ways of thinking and doing things. They are the future of Lean.